ESA Science & Technology: Have you ever used a camera on board an interplanetary spacecraft? Have you ever used a camera on board an interplanetary spacecraft? 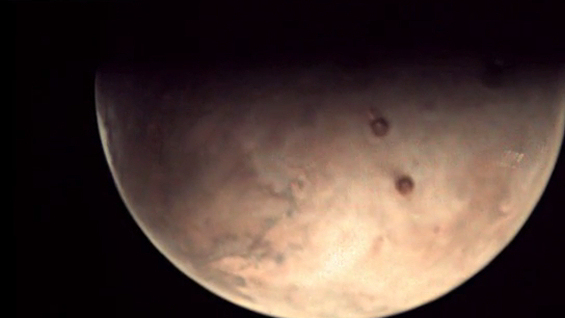 In May, the 'webcam' on board Mars Express will be available for public imaging requests. We are inviting schools, science clubs and youth groups to submit proposals for one of eight opportunities to image another planet. ESA are inviting public proposals for a number of observation slots using the Visual Monitoring Camera (VMC) on board Mars Express. VMC – the 'Mars Webcam' – is a simple, low-resolution device that was originally intended only to provide visual confirmation of Beagle lander separation. Since 2007, it has provided unique images of Mars, including crescent views of the planet not obtainable from Earth, which are routinely shared via a dedicated blog and Flickr. While it's not a scientific instrument as such, and despite the low resolution, the camera delivers good quality pictures of intriguing martian features, including cloud and atmospheric activity and surface features like Olympus Mons and the Tharsis Montes. In May, Mars will be in solar conjunction, meaning that line-of-sight radio signals between Earth and Mars Express will be disrupted by the Sun. As a result, the spacecraft's professional scientific payload will be switched off. This offers a first-ever, three-day period when the VMC camera can be freely pointed at almost any target from almost any point in the 300 × 10 000 km orbit. Full orbit: How an astronaut will view Mars from orbit - with distance counter. We're inviting schools, astronomy clubs, science centres and other youth-engaged organisations (see eligibility details here) to propose targets for VMC imaging, which will be scheduled into an observation campaign that will run from 25–27 May. While any number of eligible groups may submit proposals, only the most promising will be selected, one slot per group, corresponding to the eight (or so) observation slots available (the number varies depending on the targets proposed). Proposals must include the desired observation target, a brief note about why it's interesting and a description of the intended project that will fully exploit the images. Proposals with strong educational value and representing a cohesive team effort will have the best chances of being accepted. In return, ESA expects that groups that are awarded a slot will use 'their' image set in a scientific or artistic project that makes full, imaginative use of the visual information they contain. The projects must be shared with us, and we'll publish these later in the VMC blog. The VMC image sets will be downloaded to Earth by 28 May, and then delivered to participating groups electronically. Projects should be completed by the end of the current academic year, or 31 July, whichever comes first. In principle, almost any large feature on the martian surface can be imaged. However, during the limited three-day imaging campaign, the Mars Express orbits may not offer the best views of all possible targets. A more-detailed description of the Mars Express orbits, ranges of visibilities and timings/altitudes for imaging slots, together with examples of potential targets – like Meridiani Planum, the target location for ESA's 2016 Mars lander, Schiaparelli – are available in the Mars Express blog. The call for proposals period opens today and runs through to 27 March; any interested groups must register via the link below to indicate their interest and provide details on their requested imaging target and their planned science/art project. On 19 March, the Mars Express mission team will provide a tutorial via an #ESAHangout in Google+ and YouTube on the VMC camera and how its images are planned and acquired. Proposals can be amended afterwards, and all submissions must be firm by 27 March. We'll announce the successful proposals a few days later. Questions? Tweet using the official hashtag #vmcschools, or post a query in the Mars Express blog.